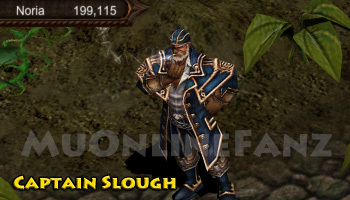 Captain Slough <+> [MU Online Fanz] <+> Official 3rd-party [MU Online] Fan Site & Game Guide! This NPC is a little obsolete. Captain Slough can teleport you to Acheron in exchange for a Spirit Map. However, you can warp to Acheron via the Warp Command (requires Zen). This NPC can be found in Noria (197, 113). 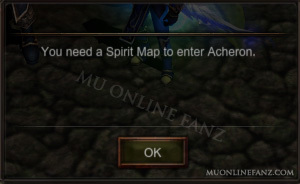 In exchange for a Spirit Map, you'll be teleported to Acheron. Using this NPC doesn't require Zen. 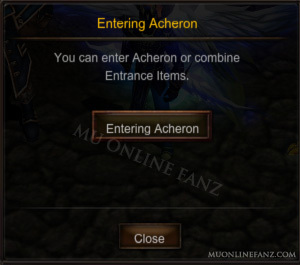 Characters must be at least level 300 to enter Acheron. Acheron can additionally be accessed via the Warp Command, however that method requires a fee.